Upon entering the game players are able to choose the rough vicinity on the world map of their starting village, guided through the game initially by an NPC Lord players will quickly come to grips with the many features and systems within the game. 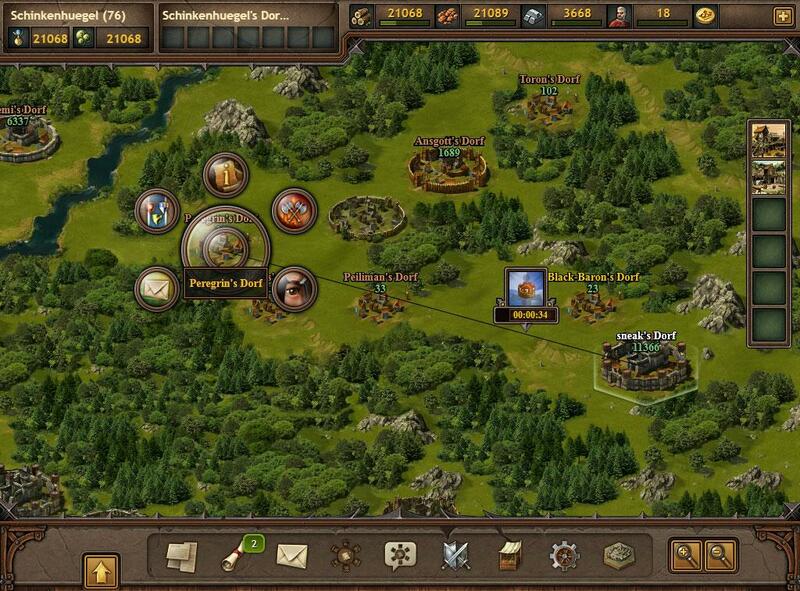 Essentially the game revolves primarily around earning resources including Wood, Clay, Iron, Provisions and Crowns, which are then used to construct a variety of different buildings as well is training up military units to either defend your lands or conquer neighbouring towns controlled by players and challenging AI opponents. The Headquarters is the heart of any village, initially starting as an old-fashioned motte and bailey the status of the Headquarters is a benchmark of how advanced the village itself is, as the Headquarters is upgraded players will have other structures made available to them. There are various key buildings within a players village that they are able to upgrade that will benefit them in different ways, the Timber Camp, Farm and Iron Mine are typical resource production buildings that will yield a certain amount of resources depending on their level. Another important building is the Barracks, a necessary building that allows players to train up their own units ranging from both defensive and offensive units, which again cost a number of resources per unit as well as taking time, anything from minutes to hours depending on the level of the unit (as well as buildings). Building, training and reading troops can all take an extended duration of time and players have the option of pushing such actions spending their Crowns, the premium currency within the game that players can purchase but can also be earned through gameplay. Using the global world map players can get a quick overview of the other villages in the world, most importantly those that are close by. Using the key players can quickly identify their own village, other villages that they control, other player villages and the Barbarian AI villages. Some player villages will also be identified with a blue shield next to its name, showing that the village is currently under Attack Protection, meaning that it cannot be attacked by other players for a period of time. When engaging in combat players are able to option and they choose which units and how many of them they wish to send on the attack, ideally focusing on offensive units and using defensive units to defend territory. Players are also able to activate various officers that can help lead an army to victory by providing them with buffs and bonuses to combat. An attack takes time as the troops slowly make their way across the map in real time to their attack objective, which can take minutes or hours, determined by the distance to the objective is. If successful in battle the attacking forces are able to loot resources from their targets and if the village is crushed completely then the player is able to occupy the village for themselves. After each battle players are given a Battle Report to show which soldiers were lost by both involved forces as well as the amount of loot recovered if the battle was successful.